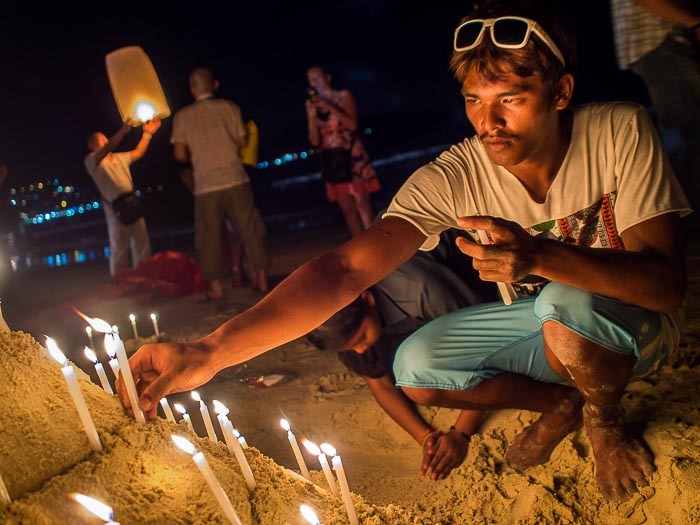 A man lights candles during a memorial service on Patong Beach on Phuket for victims of the 2004 Indian Ocean tsunami. A huge undersea earthquake jolted the waters off Indonesia on the morning of December 26, 2004. The earthquake roiled the ocean and spawned a huge tsunami which spread death and destruction across the Indian Ocean and Andaman Sea. More than 250,000 people were killed in the tsunami, swept out to sea, crushed by debris or drowned, trapped their homes, mosques, temples and churches. About 5,400 people were killed in Thailand. About half those killed were foreign tourists, who flock to Thailand’s Andaman Coast in the week between Christmas and New Year. It’s the height of the high season for the Thai travel industry. The resorts in Phuket, Phi Phi, Ranong and other beach resorts were packed. 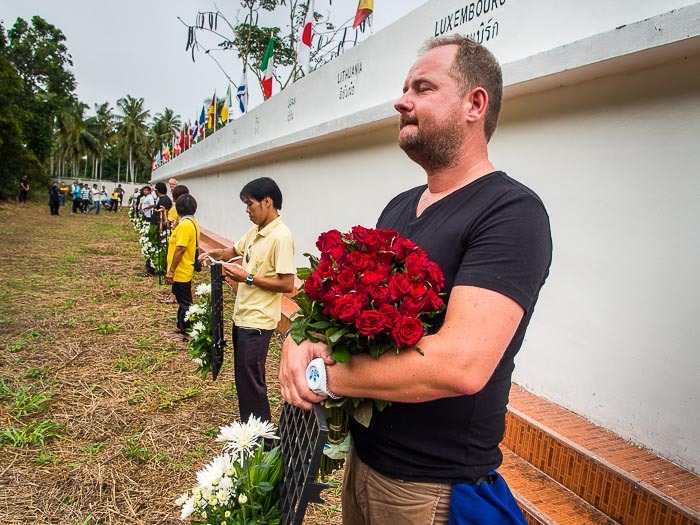 A Dutch survivor of the tsunami at a wreath laying service in Mae Khao. The tsunami came ashore a little after 9AM. Some people had gone early to the beaches, others were still eating at their hotels’ buffets. The water crushed everything in its path. In Patong, on Phuket island, the wave came into town about ½ of a kilometer before going back out to sea. The town’s densely packed beachfront hotel district was ground zero for the devastation. Hundreds of people died. This weekend was the 10th anniversary of the tsunami. There were somber memorial services throughout the region. I went to services in Mae Khao, north of the Phuket airport and Patong. Mae Khao served as the main morgue for tsunami victims. Bodies were stored here for weeks, kept on dry ice to prevent more decay, while identification was made. Today the jungle has reclaimed what was once a scene of so much sadness. There’s a small wall in Mae Khao memorializing the work that went on here, but unless you know it’s there, you’re likely to drive right by it on the highway that heads north from Phuket to the Thai mainland. 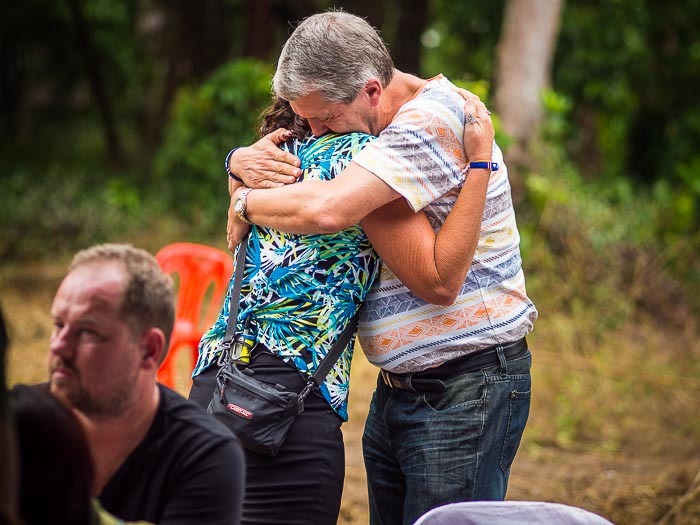 Australians who live in Phuket, and volunteered during the tsunami recovery efforts, hug at the wreath laying ceremony. In Patong there was a candle light ceremony. Thousands of candles were buried in the sand and lit after sunset. They created a beautiful glow as people walked silently across the beach. Thailand’s Andaman coast was wrecked by the tsunami, but as bad as the damage was in Thailand, the wreckage was far more severe in Banda Aceh, Indonesia, and Sri Lanka. Thailand got a lot of press coverage in the days following the killer wave because so many European tourists vacation here (about half those killed in Thailand were foreign tourists) but the damage was much worse elsewhere. 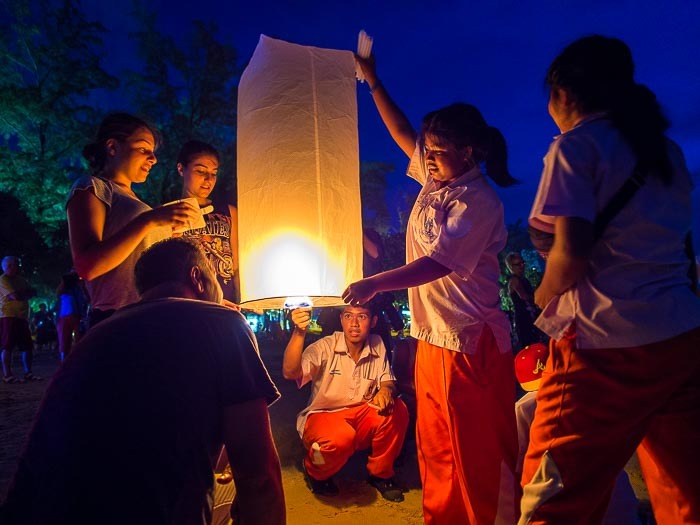 Thai students help foreign tourists light a lantern during the memorial service for tsunami victims. There are more photos of the tsunami memorials in my archive or available from ZUMA Press.